You're probably tired of hearing about poetry and science, but that connection is what led me to today's Poetry Maker, Georgia Heard. I was teaching middle school science in an enrichment program underrepresented youths enrolled in the Buffalo City Schools. I found the lack of poetry in their lives to be startling, so even though I wasn't their English teacher (as they often reminded me! ), I frequently used poetry to begin or end our lessons together. Georgia's book Creatures of Earth, Sea, and Sky was one I turned to for the study of animals. When we began to look closely at reptiles I liked to read this poem. instead of each day of the year? Fish and frogs get poems for two voices in this collection. 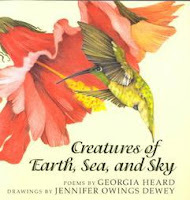 Other animals described in verse include the elephant, bat, raccoon, hummingbird, eagle, dragonfly, and more. Since I'm a fan of bat poetry, I must share the bat poem as well. chasing moths around a streetlight. the bat patrols the night. Before I talk more about Georgia's poetry, let's learn a bit more about her. Georgia: When I was around eight years old I began writing poems to celebrate family members’ birthdays. One time I was reading a birthday poem to my grandmother and she started to cry – not from sadness, I hope, but from love. It was the first time I realized that words had the power to make people feel, and my feelings about my grandmother were translated through words. That was a revelation to me – and I started to believe that words have the power to heal, to move and to make change. Georgia: I began to write in a diary when my father left to fly helicopters in Vietnam. It was a confusing, and incredibly energizing time in America – especially since we lived just outside of Washington D.C. I wrote how I felt in my diary, and it helped me cope with my father’s long absence. Georgia: After I received my Masters of Fine Arts in poetry from Columbia University, I began teaching poetry in the New York City schools. It was then that I started to read children’s poetry, and share children’s poems with my students. Georgia: I received my Masters of Fine Arts in poetry at Columbia University. I had the good fortune to study with some of the finest poets in the world. I studied metrics, poetic form, read extensively and created a small book of my own poems. It was there that I met my mentor and teacher Stanley Kunitz who was one of the big reasons I continued to write poetry. Georgia: I’m a very slow writer. I write a draft, and then I need to let the words sit for a few days before I reread the poem again. And then it’s a process of eliminating words, adding words, starting over, perhaps sending it to a friend to get feedback, starting over again, and then slowly, slowly the words are transformed into a poem. Georgia: I love remembering my own perceptions, and feelings when I was a child and trying to write from that state of mind. It’s so rewarding to read poems I’ve written to children, and afterwards they raise their hands to share some of the same things they’ve experienced. Georgia: My new book, Falling Down the Page: A Book of List Poems, was so much fun to collect and write. It’s amazing to see how an innovative and beautiful design by John Grandits can support already brilliant poems written by Rebecca Kai Dotlich, Naomi Shihab Nye, Jane Yolen and many others. Georgia: Yes, I’m working on an anthology of children’s poems written by all the incredible children I’ve had the fortune to work with. Georgia: Emily Dickinson. Walt Whitman. Georgia: In my writing chair, and on an airplane. Georgia: All my poetry friends! In addition to writing poetry, Georgia is passionate about educators how to read and write poetry in the classroom. In her book Awakening the Heart: Exploring Poetry in Elementary and Middle School, wrote this about writing poetry. Sometimes my poems are sparked by passion and concern, as with the poems in Creatures of Earth, Sea, and Sky. When I was in college I wanted to be a scientist—an oceanographer. The classes were conducted in a windowless auditorium consisting of hundred of students. We never got to go outside, but instead had to memorize equations of waves breaking, written on the overhead projector. I think it's because of this sterile, life-less way of learning about the ocean that I decided to become a poet. But many of my poems are fueled by that same scientific urge to observe and know the world. In Awakening the Heart, Georgia focuses on how teachers can create an environment where poetry is welcomed and encouraged. There are chapters on reading it, writing it, and learning to craft it. I particularly love her notion of two poetry toolboxes to help craft poetry. The meaning toolbox contains things that help writers in "expressing feelings and experiences through visual and sensory tools." This toolbox contains metaphor, simile, personification, words, line-breaks, beginnings/endings, titles, and observation. Isn't this a great place to start? I could spend a whole year just working with these tools! The music toolbox contain things that help writers in "expressing feelings and experiences through auditory, musical and rhythmic tools." This toolbox contains rhyme, repetition/patterns, rhythm, alliteration, words, line-breaks, onomatopoeia, assonance, and consonance. As Georgia takes teachers through the book, she includes many of her own poems, as well as examples written by well-known poets and the children she has worked with. Georgia's latest book, Falling Down the Page, is a fabulous collection of list poems selected by Georgia. Here's what she has to say in the book's introduction. Out for a walk in New York City I see: yellow cabs speeding down Broadway; people lounging in overstuffed chairs at a coffee shop. I hear: cars honking; a dog barking in the distance. As I walk along I make a list in my head of what I observe just like Walt Whitman did over one hundred years ago in his famous list poems Song of Myself. The list or catalog poem is one of the oldest and most accessible of poetic forms. Here are the two poems Georgia contributed to the book. This is a wonderful book, full of surprises. It opens vertically and is visually very interesting. (It was designed by John Grandits, so this should come as no surprise to anyone who's seen his concrete poetry books!) This will not only be great for read aloud, but will also make a terrific mentor text for students learning to write list poems. To learn more about Georgia and her tireless efforts to get poetry into the classroom, visit her web site. Three cheers for Georgia and a heartfelt thanks for participating in the Poetry Makers series. All poems ©Georgia Heard. All rights reserved. Her resources, like her poetry and this interview, are generous and inspiring. Her process will be my mini-lesson today. Thanks! I love her work and have Awakening the Heart. I must get the new title. Tricia, I love reading these posts. I know it must have taken oodles of time to put together.Thank you. Oh, I haven't heard of this poet before, but I very much like her bottom-to-top poetic style, and her snake poem is about how I think dressing ought to go! Georgia has always been one of my favorite poets and teachers. Her six-room poem never fails to inspire my students to write with beautiful imagery. Thanks for these interviews.